y most any company’s standards, erecting the world’s tallest tower—the TOKYO SKYTREE®, at a height of 2,080 feet—would be an insurmountable architectural feat. But for the Obayashi Corporation, it was merely a warm-up. In 2012 the global construction, civil engineering, and real estate development conglomerate announced that it had begun research so that it could assemble a 96,000-kilometer (59,652-mile) carbon nanotube cable that will extend from Earth into the cosmos to support a space elevator. Akihisa “Aki” Miwa (M.S. 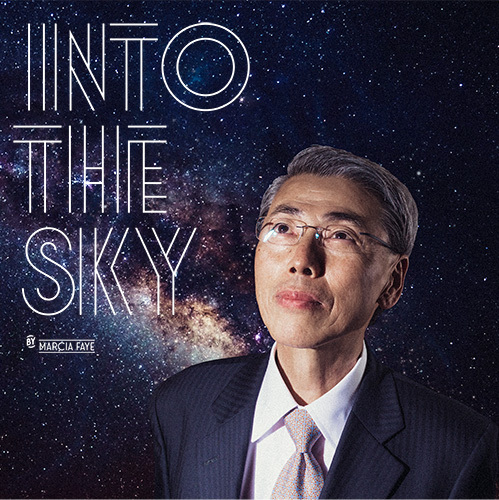 OR ’83), general manager of Obayashi’s Technical Division, says that the company, where he has been employed since 1974, has always had one eye just beyond the horizon. 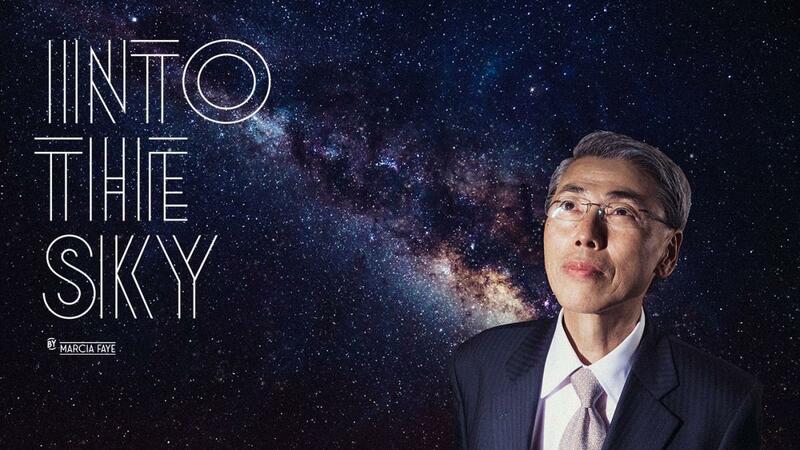 “Regarding technology development, we are spending 70 to 80 percent of our budget on current issues; 20 percent of our budget is for future things—sometimes dreams, too,” Miwa says, with a hint of a smile, noting that no matter the project, his company’s focus is on benefiting society. With a target year of 2050 for the completion of the space elevator, whose price tag is as yet undetermined, Miwa, who oversees the project’s engineering team, says that the lift would carry humans and equipment to various celestial waystations for tourism, commerce, and exploration. At an estimated space cargo delivery cost of about $100 per pound, the elevator could replace conventional rocket launches at a significant savings both in cost and to the environment. On Mies Campus last December to accept Illinois Tech’s 2016 International Award of Merit, Miwa also made a presentation about the space elevator, the TOKYO SKYTREE, and other innovative Obayashi projects including the award-winning Mike O’Callaghan-Pat Tillman Memorial Bridge, a.k.a., the Hoover Dam Bridge, the longest arch concrete bridge in the Western hemisphere, completed in 2010. In the audience was David Arditi, professor and director of Illinois Tech’s Construction Engineering and Management Program, who is confident that Miwa can continue his stellar achievements. The carbon nanotube cable will be anchored underwater near the equator and extend to a geostationary Earth orbit (GEO) satellite that circles over the equator. The cable will then extend into outer space and end at a 12,500-ton counterweight, which serves to balance the entire apparatus. The elevator will rotate with Earth’s rotation. The cable will have the capacity to support 100 tons of climbers and transportable equipment. The floating Earth Port, for departures and arrivals, is the connection point to Earth’s surface. The first waystation is the Mars Gravity Center. Training simulating the Martian environment will be done here. The Lunar Gravity Center will house research and moon training facilities. 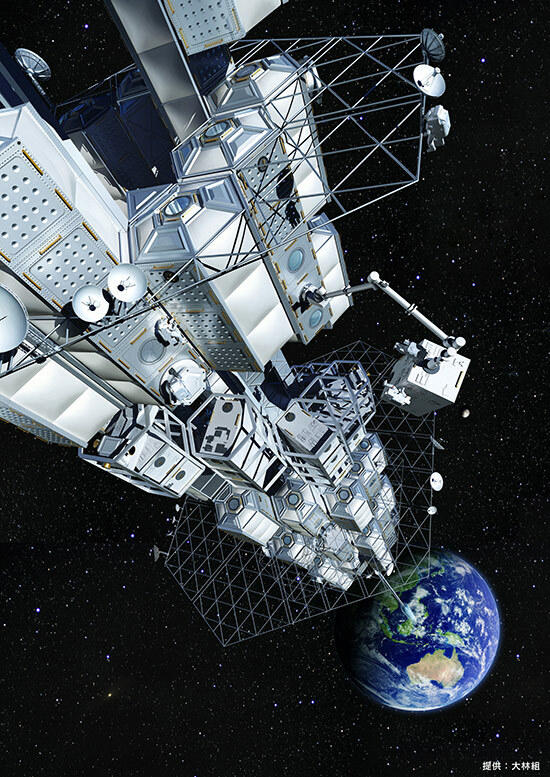 Artificial satellites can be brought up the space elevator and dropped through the Low-Earth Orbit Gate. Geostationary Earth Orbit Station is a multitask, state-of-the-art lab facility. It will be a launching point for GEO satellites and feature modules allowing for microgravity movement to viewing windows for space tourism. 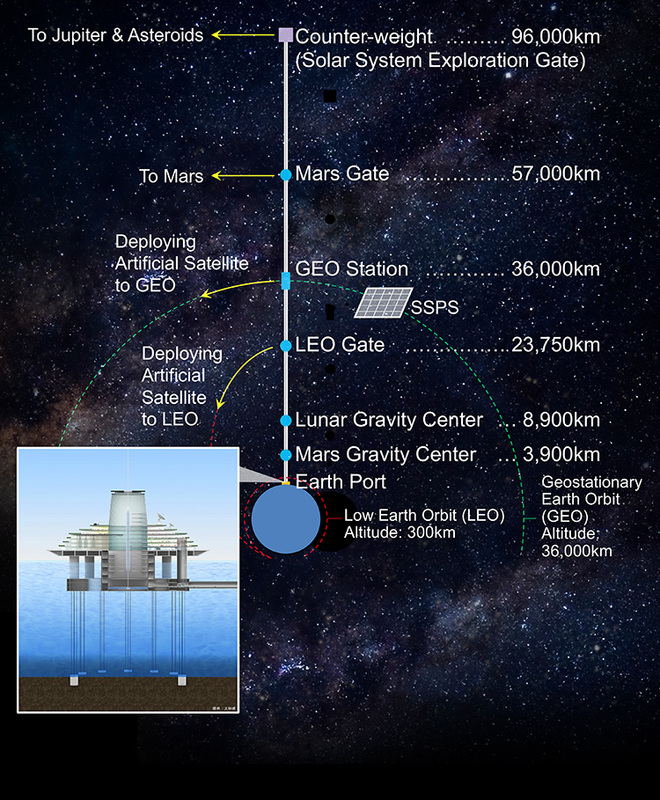 Beyond this station, the space elevator is open to accommodate spaceships for solar system exploration. Mars Gate will be a site for Mars transfer vehicles. The 12,500-ton counterweight will also serve as a Solar System Exploration Gate that ejects spacecraft making journeys to the asteroids or to Jupiter.